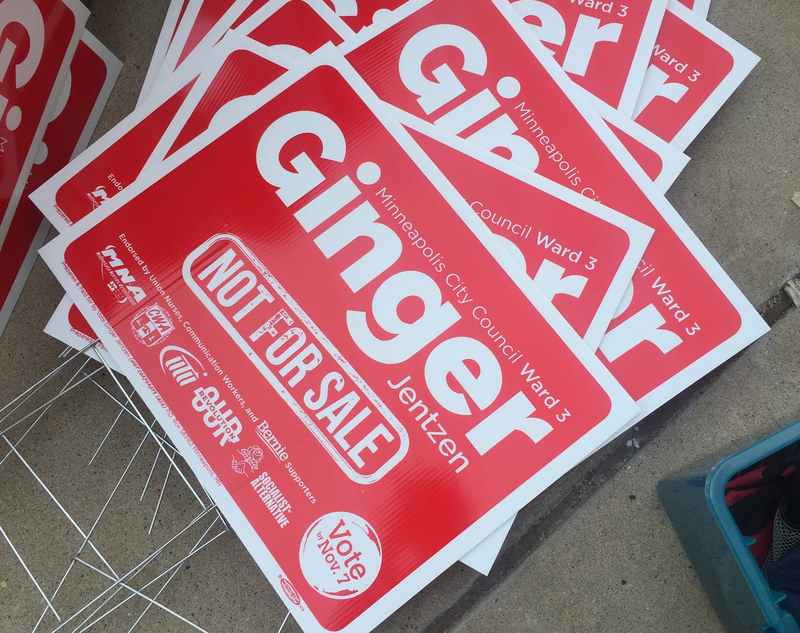 In Minneapolis, Socialist Alternative member Ginger Jentzen’s City Council campaign is shaking the political establishment to its core. Running on a strong socialist platform, Ginger is fighting for bold policies like rent control and taxes on big developers and millionaires to fund affordable housing and social programs. The campaign is a way to build a powerful grassroots movement of the 99% to push back against the corporate agenda in City Hall. Against a background of a city that has one of the largest levels of economic and racial inequality in the nation, Ginger’s bold campaign is receiving a strong echo from workers and young people. In early August, when the first financial reports were released for the election, it was shown that Ginger had raised over three times as much as her Democratic establishment-backed opponent. Not only that, but she had done it as the only candidate in either the Mayoral or City Council elections pledging not to take a dime in corporate cash. Truly a campaign that is NOT FOR SALE. Make Life Easier for Developers? This stands in stark contrast to the Democratic-establishment backed opponent Steve Fletcher, who, despite much progressive rhetoric, has said he’ll take money from big developers – stating in a September forum hosted by the Chamber of Commerce that he wishes to “make life easier for the developers” in Minneapolis. He further said he didn’t understand why developers were being singled out. The truth behind this statement is that the city political establishment doesn’t want them singled out. Though Minneapolis has not yet reached the peak housing and unaffordability crisis levels of cities like New York or San Francisco, gentrification has accelerated and housing prices have been skyrocketing over the last several years. Like many other big cities, Minneapolis has long been dominated by the establishment of the Democratic Party, known as the DFL (Democratic-Farmer-Labor Party) in Minnesota. The DFL establishment has carried out a “business-as-usual” agenda based on large handouts to corporations while shifting the economic and social burden onto the backs of working people. The Twin Cities are home to 17 Fortune 500 companies making massive profits, yet Minneapolis Mayor Betsy Hodges’ newly proposed 2018 budget contains regressive tax increases on working-class and poor homeowners. And, despite progressive talk about supporting the successful fight for a $15 minimum wage led by Socialist Alternative and Ginger Jentzen earlier this year, the Mayor’s budget proposal would only create one full-time position with responsibility to enforce the new wage for 71,000 workers across the city. Given that American workers lose $50 billion to wage theft each year – over three times as much as the value of all property crimes – the proposal is nothing but lip service to the needs of working people. The Minneapolis political establishment has long failed to address deep systemic problems with police brutality in the city where Jamar Clark and Philando Castile found no justice. Ginger is calling for a democratically elected community oversight board, with full powers over the police, including the right to subpoena officers. In her 2013 campaign, Hodges called herself a “progressive,” as Ginger’s DFL opponent Steve Fletcher does now. However, the road to hell is paved with good intentions. Unless Fletcher decisively breaks with the DFL establishment and refuses to take corporate cash, he cannot truly be expected to stand up to the pressures of elected office. Ginger has already stood up to these interests and not faltered. As leader of the 15 Now campaign, Ginger helped build an independent grassroots movement of workers, unions and community groups to make Minneapolis the first midwestern city to win a $15 minimum wage. She did this in spite of opposition of big business and the city establishment. Ginger is a true fighter for the interests of working people and many of the most progressive labor and political groups have endorsed her, including the Communication Workers of America MN State Council, Minnesota Nurses Association, Our Revolution Twin Cities, and the Democratic Socialists of America. Electing a second independent socialist to a city council in a major city, after Kshama Sawant’s successful election and reelection campaigns in Seattle, would not only be a victory for working people in Minneapolis, but would be an important beacon across the country for working class politics. It would show that what Socialist Alternative has done in Seattle since 2013 is not an isolated incident but the music of the future. Electing Ginger can embolden workers and young people across the country to join us in the project of continuing the political revolution and building a new party of the 99%.